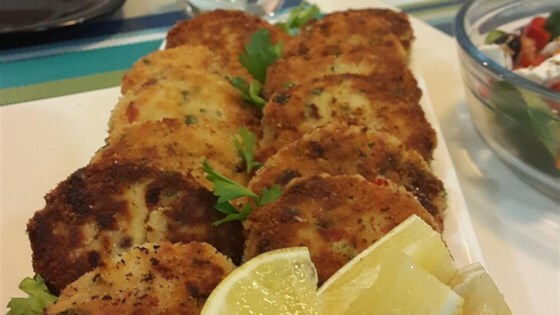 "These crab cakes are just the best. I make these often at home, and I make a smaller appetizer size for parties. They are always a hit. They are easy and delicious. I won't eat crab cakes out anymore! Serve with fresh squeezed lemon and tartar sauce!" In a bowl, toss together the 1/3 cup bread crumbs, green bell pepper, red bell pepper, green onions, and parsley. Mix in the egg white, mayonnaise, lemon juice, Worcestershire sauce, and Dijon mustard. Season with Old Bay seasoning, dry mustard, and onion powder. Fold crabmeat into the mixture. Form into 6 large cakes. Coat in the remaining 1/2 cup bread crumbs. Heat the oil in a large, heavy skillet. Fry the cakes 5 minutes on each side, or until evenly brown. Drain on paper towels. See how to make a cakes recipe that really shows off quality crabmeat.